Blog to End the Occupation: Olympia Food Co-op Fights Back Against Israeli-backed "Lawfare"
Olympia Food Co-op Fights Back Against Israeli-backed "Lawfare"
In July 2010, responding to Palestinian civil society's call for boycott, divest and sanctions (BDS) against Israel until it respects Palestinian human rights and international law, the Olympia Food Co-op became the first grocery store in the United States to institute a boycott of Israeli-made products. In September 2011, a lawsuit, orchestrated by the pro-Israel organization StandWithUS, was filed against the Co-op accusing the Co-op's Board of procedural violations in enacting the boycott. Lawyers for the Co-op have filed a motion to dismiss the lawsuit arguing that it is a form of legal and financial intimidation intended to silence free speech and penalize political participation. Below is the press release from Olympia BDS detailing the Co-op's legal response to the lawsuit. For more details regarding "lawfare" as a tactic to suppress, deter and malign pro-Palestinian protest or solidarity, as well as the relationship between the Israeli government and StandWithUs, please read Ali Abunimah's article at The Electronic Intifada. Olympia, WA. 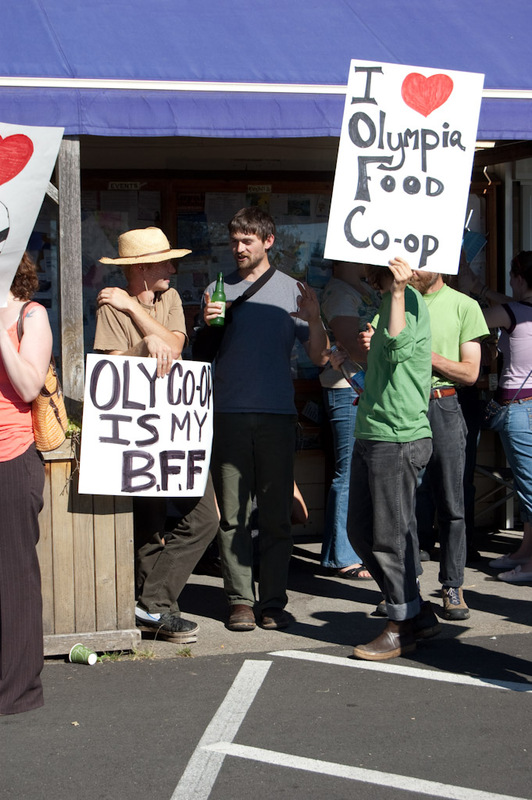 On behalf of the Olympia Food Co-op, lawyers from the Center for Constitutional Rights (CCR) and Davis Wright Tremaine LLP filed a motion to strike the lawsuit that has been filed against the Co-op in response to its boycott of Israeli products. The motion asserts that the lawsuit is a Strategic Lawsuit Against Public Participation (SLAPP), a form of legal and financial intimidation, popularly dubbed “lawfare,” which has long been used to undermine social and environmental justice movements by penalizing political participation and free speech. “This lawsuit, which seeks to penalize local citizens for exercising their rights as Board members to express views on Israel and the problems in the Middle East, presents a fundamental First Amendment issue,” says Bruce Johnson, author of Washington’s Anti-SLAPP Law, a member of the Co-op’s legal team. In the past, Johnson has represented organizations such as The Yes Men, and successfully motioned to dismiss invasion of privacy and misappropriation claims relating to the documentary film Sicko by Michael Moore. The lawsuit is part of a fierce response to the growing global movement for Boycott, Divestment and Sanctions (BDS) of Israel until it ends its occupation of Palestine, respects the right of return of Palestinian refugees, and gives equal rights to Palestinians living inside of Israel. This backlash is coming from pro-Israel groups as well as directly from the Israeli Government, which recently passed a law that criminalizes advocating for boycotts of Israel. An ultimatum from the plaintiffs sent to the Co-op before the lawsuit was filed reads: “If you do what we demand, this situation may be resolved amicably. If not, this process will become considerably more complicated, burdensome, and expensive than it has been already.” The plaintiffs have refused to bring the issue to a vote – a democratic option available to any Co-op member – and have instead resorted to the court system in an effort to force their demands upon the Co-op and its membership. The Co-op’s boycott of Israeli products was enacted on July 15th last year by a consensus decision of the Board of Directors, honoring a 2005 call from Palestinian civil society. The Co-op has a rich history of taking stands for social justice. It has honored boycotts of apartheid South Africa, Coca-Cola, and grape growers in support of the United Farm Workers, among others. One of the plaintiffs, Kent Davis, didn’t become a Co-op member until after the boycott was enacted, and is now purporting to bring the suit on behalf of the Co-op itself. Three of the plaintiffs lost by large margins to openly pro-boycott candidates in the record voter turnout November 2010 Co-op Board elections, demonstrating widespread support for the boycott among Co-op membership.